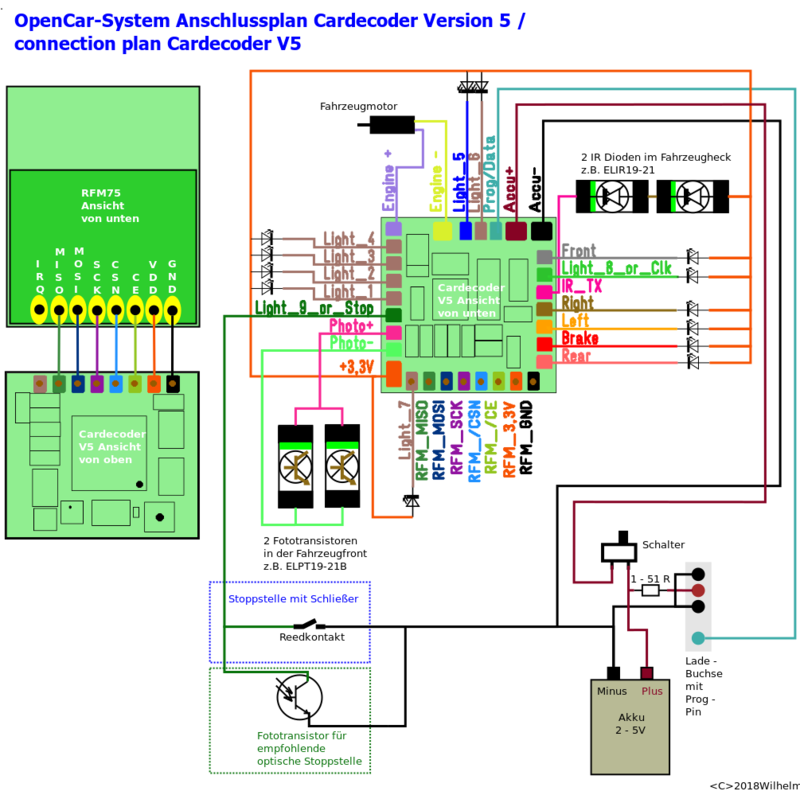 In order to be able to control the cardecoder with a radio signal, an RFM70S, RFM73S or RFM75S radio module has to be connected. There are 7 connections needed: + UB RFM, GND RFM, CE, CSN, SCK, MOSI, MISO (the eighth IRQ wire in the schematic is not needed on the Cardecoder). These connections are compatible with the RFC7x radio module at the bottom edge of the Cardecoder V5 pin. The cardecoder can be easily "piggybacked" or "opposite" connected to the RFM7x. To receive the information for the distance control and to control with DCC-IR-signals, two (one right and one left) photo transistors are needed at the front of the vehicle. The collectors are connected with Photo+ and the emitters with Photo- at Cardecoder. The cables of the photo transistors, are to be laid separately and twisted together to the Cardecoder. Here they are parallel connected. The connection for the stop section (Light_9_or_Stop) follows dark green on the left. There are two options for this. The stop input can be triggered either by a photo transistor (optical) or a reed contact (magnetic). If no stop section is required, this port can be used as additional light_9 output. Next follow the LED outputs light_1 to light_7. These are freely programmable with effects and can be switched with the functions F0 to F12 (with the exception of F3 and F4). The output light_5, can be used for various switching functions, his behavior can be defined in CV 33. It continues in gray with the headlights, the turn signal right and left, the brake light and the rear light. In between lies the output Light_8_or_Clk. This is when connecting the decoder extension (Clk). Without extension, it can be used as an additional output. Light_8. Furthermore, here is the connection for the IR diodes of the distance control (IR_TX). At the top center is the blue-gray programming port (Prog/Data), this should be laid out to the software update. For this you should on the vehicles, the original charging socket (bottom right in the picture) to a contact (at a double distance, no matter on which side) expand and connect the programming line there. The Prog / Data connection is additionally required for the operation of the decoder extension. At the top left of the decoder are the motor connections Engine- and Engine+. Top right the battery connections Accu+ and Accu-. Remains the +3,3V for the vehicle lighting left. The connector is located at the bottom of the left side of the Cardecoder V5. The Charging / programming socket has already been mentioned, bleibt noch der battery and the charging resistor. This is installed in the original vehicles to match the different battery sizes to the Faller © charger. I think this is only for "occasional riders" fit, because it takes between 7 and 14 hours to recharge a vehicle. If you use fast chargers instead, this resistor can be a hindrance and even dissolve into "smoke"! Its dimensions depend on the type of battery and charger and must be exactly adjusted. This resistor has a protection and safety function, it must not be left out! For the battery applies: the bigger, the longer my vehicle drives. The decoder hardware copes very well with 2 NiMh cells or a Lipo / LiFePO4 cell. In H0 vehicles, IPOD nano replacement batteries with 330mAh or 400mAh have proven themselves for trucks and buses. 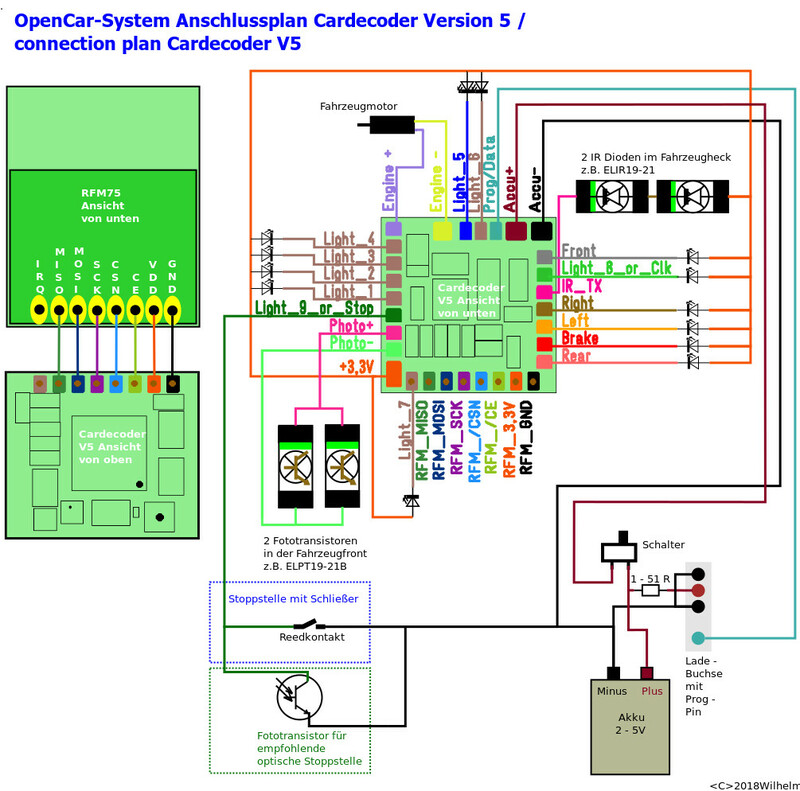 At the Cardecoder V5 also the optional "PowerOff" board known from the V3 can be used to switch off the vehicle.